Luckily for Ferret Scout Car owners in Cincinnati, there are repair resources available to keep the machines on the road. 2 shops in the Madisonville area with Ferret experience are Eurauto and Brindle's Cincinnati Motor Car. The owners both own Ferrets and other military vehicles, and are enthusiatic collectors. 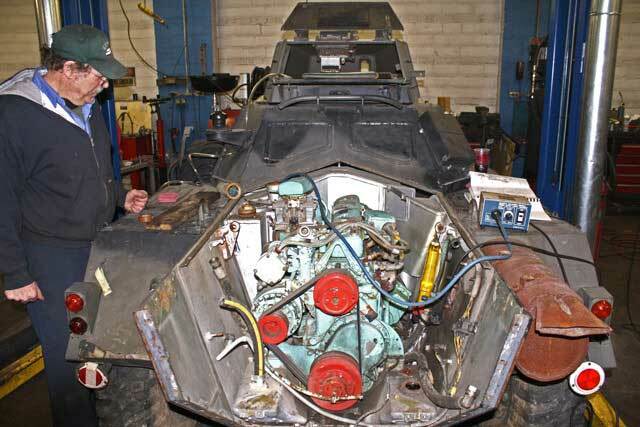 They also collaborate on projects, with the latest being a Ferret engine swap. Tim Brockman, who runs Eurauto, owns this particular Ferret, which suffers from a locked up motor. The repair for this engine would take a lot of expensive machining, as the motor was seriously damaged. Getting another one from England has gotten prohibitively expensive since 9/11, but luckily he came across a virtually new motor in an ad in Military Vehicles magazine. The guy in Texas had bought this motor sight unseen to repair a Rolls Royce, but soon realized it wasn't the correct motor. It sat around his garage for years till he took out the ad to sell it. Now with the new motor in hand but no time to install it, he farmed the job out to John Brindle who owns Brindle's Cincinnati Motor Car. Another project in John's lot is a British Scorpian waiting for a new Jaguar motor. British cars are also John's forte, and he owns several rare cars, including a '52 Allard K-2 and a Sunbeam Tiger. 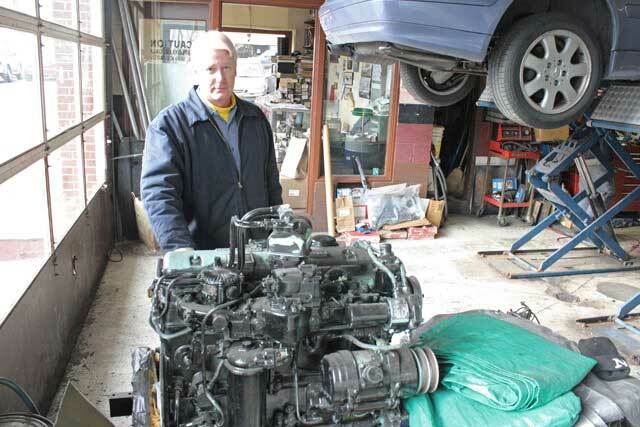 Many British cars have gotten a new lease on life going though Cincinnati Motor Car. 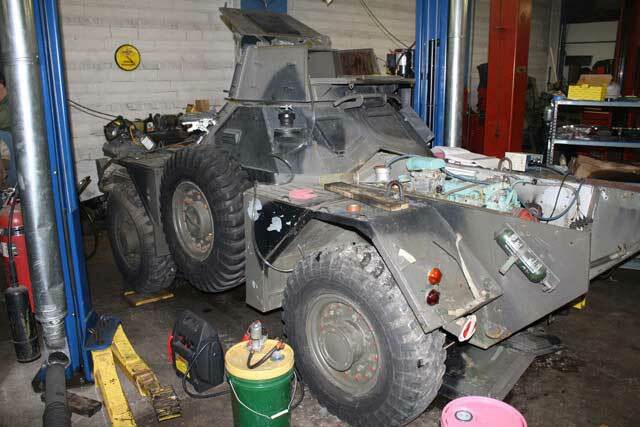 The new motor for this Ferret is slightly different, and although there were several motor upgrades through the Ferret's production life, this one seems to be from a Humber Pig, a British armored personnel carrier. The Ferret has a dry sump system for lubrication, whereas this motor has a wet sump. Being just another variation on the same motor, everything will bolt up. 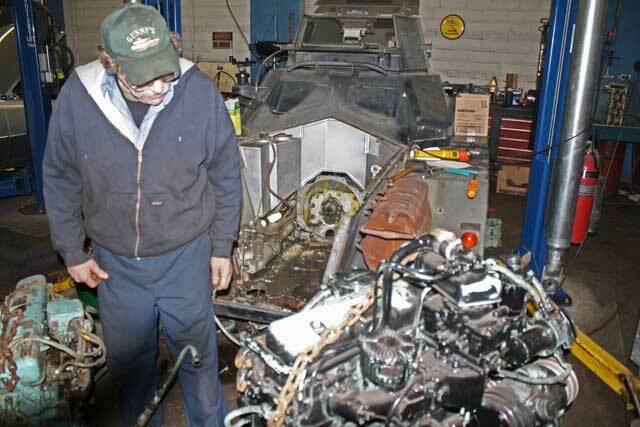 As far as getting the engine out, the access is much better than the Mercedes and BMWs usually worked on at the shop. No worries about extra stuff like air conditioning or catalytic converters to get in your way. In an afternoon the engines are sitting side by side to sum up the differences. One interesting thing about these motors is the small brass cylinder bolted to the thermostat housing. 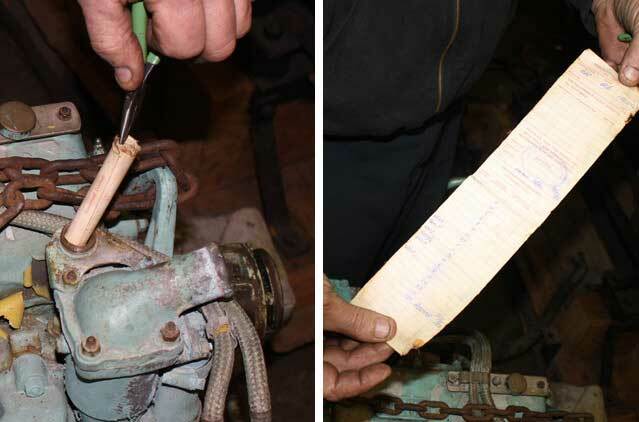 This holds a rolled up parchment with a detailed history of anything the British Army had done to this motor. It's also nice to have the original workshop manuals to get the job done right. When it's done, Cincinnati roadways will host something a little more interesting than it's usual fare of Toyotas and Chevy trucks.